The Sony XBR-65X900A is a big, beautiful TV. There were times when I was watching this 65-inch screen that I simply caught myself marveling at the quality of the picture. Now, this Sony is one of the new breed of Ultra HD (4K) televisions, but my viewing Nirvana moments were not only when playing 4K content, but also HD Blu-ray movies and even the more pedestrian HD programs on Broadcast TV (all upscaled to Ultra HD by the Sony). That is not to say that the limited amount of native 4K material I had available didn't look great. The eye-popping demo materials playing on the 4K server definitely accentuated the extra resolution of this Ultra HD TV, which has four times the pixels of an HDTV (3840 x 2160 vs. 1920 x 1080). I'll discuss the UHD resolution issue next. To me, the most important point is that this Sony delivers splendid picture quality with both HD and UHD content, making it an ideal event TV for today and the future. 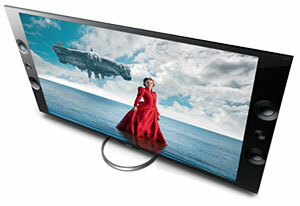 Since the first Ultra HD models were introduced late in 2012, two main complaints have been raised about the technology. The first is a psychophysical one. Simply stated, the human eye is not acute enough to perceive the difference in resolution between an HD display and an UltraHD one - at least not at the distance that we typically sit away from the screen (more than seven feet). Basically, to appreciate the extra resolution, you either need to move your chair closer or buy a bigger TV - even bigger than 65 inches. If you agree with that notion and you don't plan on changing your viewing habits then you should be fine with an HDTV, as far as pixel peering is concerned. If you are a "damn the torpedoes, full speed ahead" early adopter, then there is still a second UHD roadblock, the lack of native 4K movies and TV shows. I think that solving this shortcoming is essential to enjoying the full Ultra HD experience because there is much more to UHD TVs than resolution. A good Ultra HD display like the TRILUMINOS screen on this Sony can also render a wider color gamut (a bigger range of colors) than is capable with many HDTVs. The problem is that there is no HD material that is mastered or broadcast with that expanded color gamut. 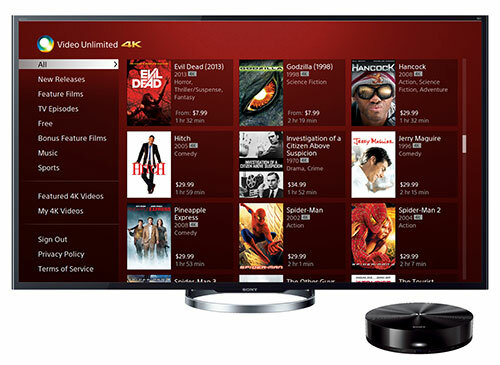 To address that situation, Sony has launched the Video Unlimited 4K service, the world's first and only 4K Ultra HD video download service, beginning with a selection of more than 70 full length native 4K Ultra HD feature films and TV shows. A Sony representative has confirmed that, "the feature films on the box and from the forthcoming service were either shot in or mastered in true 4K which incorporates the expanded color gamut which can be rendered on our TVs with TRILUMINOS Display." The content is downloaded to the Sony FMP-X1, a 4K Ultra HD Media Player, which is only compatible with Sony Ultra HD TVs. The combination of the 4K native content, the player and the TV begin to realize the potential of Ultra HD. You can read more here. I realize that some videophiles believe that no TV deserves the mythical 5 Stars, but I would be nitpicking to give the Sony XBR-65X900A anything less. The color rendition with normal HD material is impeccable. Add to that, this TRILUMINOS display ascends to another level with Ultra HD material. And the 65W speaker system on the XBR-65X900A is way, way above average, definitely wow-worthy for the fantasy football gang. Though if you want that full surround sound for your home theater, match this TV with an appropriately impressive dedicated audio system. This Sony supplies everything that I need in a TV, succulent picture quality, pages of Internet apps and an integrated Wi-Fi adapter. Oh, yeah, it also sports an Ultra HD display. You can deduct a half a point or two if you must have motion or voice control because they are not included and the TV is better off without them. If you are familiar with recent Sony TVs, you should have no trouble setting up this one. Even if you are a first timer, the initial process is straightforward. And don't be leery of the Ultra HD aspect, it doesn't add any layer of difficulty. Of course, if you do spring for this $5500 beauty, you might as well pay a professional to set up and calibrate it. It's sobering to say that a 65-inch TV at $5500 is a good value, but what the Sony XBR-65X900A offers in picture quality and Ultra HD features makes this reasonably competitive in the current UHD marketplace. In six months, with a more crowded field, I reckon that prices will start dropping out of the stratosphere and become more affordable for us mere mortals. For now, this luscious 65-inch TV - especially if you pair it with the Sony FMP-X1 Ultra HD player - proves its worth because the combination makes a solid foundation for a home theater system that will serve you well in the years to come.